Steel engraving by Scottish American artist Alexander Hay Ritchie (1822–1895), based on a daguerreotype of brevet second lieutenant Ulysses S. Grant in 1843. From A Personal History of Ulysses S. Grant by Albert Deane Richardson, 1885. Daguerreotype of Julia Dent Grant, c. 1855–61. Courtesy of National First Ladies’ Library. I was a very little girl when General Grant first came to our house; in fact, I was not yet seven years old. It was I whom he first met, and in years after when my sister Julia had become his wife it used to be my teasing boast that I knew him best because I had known him longest. 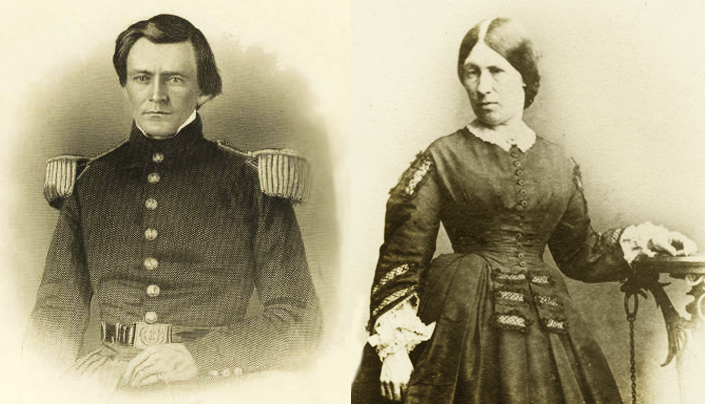 Months before little Emma met her future brother-in-law, twenty-one-year-old Ulysses S. Grant had been promoted to brevet second lieutenant after graduating from West Point, where Emma and Julia’s brother, Fred Dent, was his roommate. When Grant was ordered to report to Jefferson Barracks outside of St. Louis in the fall of 1843, Fred suggested a visit to White Haven. As it happened, seventeen-year-old Julia, the eldest daughter, was not home for that first visit, nor were any of her four brothers, “so the burden of entertaining Fred’s friend fell upon my parents and sister Nelly [Ellen],” who was fifteen at the time. “Mr. Dent,” he said, “I want to marry your daughter, Miss Julia.” . . . Colonel Dent opposed Julia’s marrying an officer; her past health issues had convinced him that she would never be able to withstand the rigors of army life. But, according to Emma, “When Julia wanted a thing of my father she usually got it.” The couple agreed, however, to hold off for a year or two, as things were heating up along the Mexican border. On March 1, 1845, Congress voted to annex Texas; on July 4, Texas voted for annexation; on December 29, Texas was admitted to the Union as a state. These events increased tensions with Mexico. “The flashpoint of controversy,” write Ron Chernow in his recent biography of Grant, “was whether the Nueces River formed the southern border of Texas, as Mexico believed, or the Rio Grande, 130 miles farther south, as the Polk administration insisted.” Grant’s regiment was already encamped in the disputed territory when Mexico declared war on April 24, 1846. Throughout the conflict, Lieutenant Grant wrote letters to his fiancée. In July, during a lull in the hostilities (between the Battles of Palo Alto and Resaca de la Palma in May and the Battle of Monterrey in September), he sent two letters from the Mexican city of Matamoros (which Grant spells Matamoras). Strategically located on the southern bank of the Rio Grande below the southernmost tip of Texas, the city had been captured and occupied by American forces in mid-May. 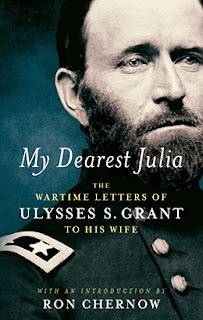 These two letters, which show a side of Grant unfamiliar to most readers, have been included in a new collection, My Dearest Julia: The Wartime Letters of Ulysses S. Grant to His Wife, and we present them here as our Story of the Week selection. Note: A bracketed space [ ] is used to indicate where words are missing or illegible as a result of damage to the manuscript of the letter. If you don't see the full selection below, click here (PDF) or click here (Google Docs) to read it—free! I am a female reader writing to say how likable Grant sounds in these letters (granted that he has every motivation to seem so) & how I empathize with his anxiety in not hearing back often enough from his sweetheart, who may not be reciprocating his dedication to staying connected & who may even burn his letters when the mood strikes---& yet he never questions that he wants her for a lifetime!